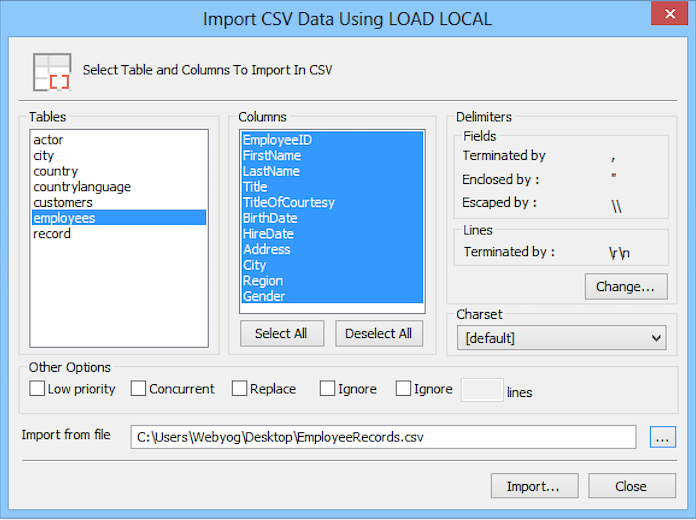 To import data from a CSV file into a MySQL table, select the table in Object Browser and select Table -> Import -> Import CSV Data Using Load Local... or(Ctrl+Shift+M). Import from Files: Enter the name of the file (or click the … button to get File Selection dialogue box to create/select file) from which the data in CSV format would be imported. Ignore lines: Starts reading data in the CSV file after skipping specified number of lines from the top in the CSV file. Useful to skip header (or a bunch of records from the top).